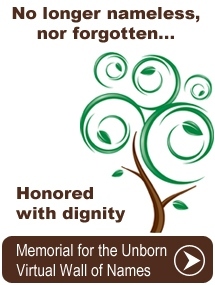 A brass name plate to be placed on our wall to remember children lost to abortion. A brick paver to be placed in the serene gardens for children lost to miscarriage. A Certificate of Life as a beautiful acknowledgement of the sweet little life lost. Often, our clients find healing in scheduling a small, private memorial service in which their plate or brick is placed and the Certificate of Life is presented. Please contact our office to schedule a memorial service or for any questions concerning honoring your child. Your information will remain confidential as we seek to assist you in your healing process and giving dignity and honor to your child.